A map makes a good extension project when a character's journey (physical, psychological, emotional, or spiritual) is a central component of a book. 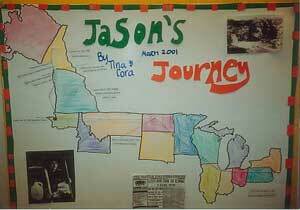 As students design their maps, they can illustrate significant events, settings, and/or themes in the character's journey. The example shown below is based on Jason's Gold by Will Hobbs. Teacher: Janine King, 6th-8th grades, Brighton School, Lynnwood, Washington.